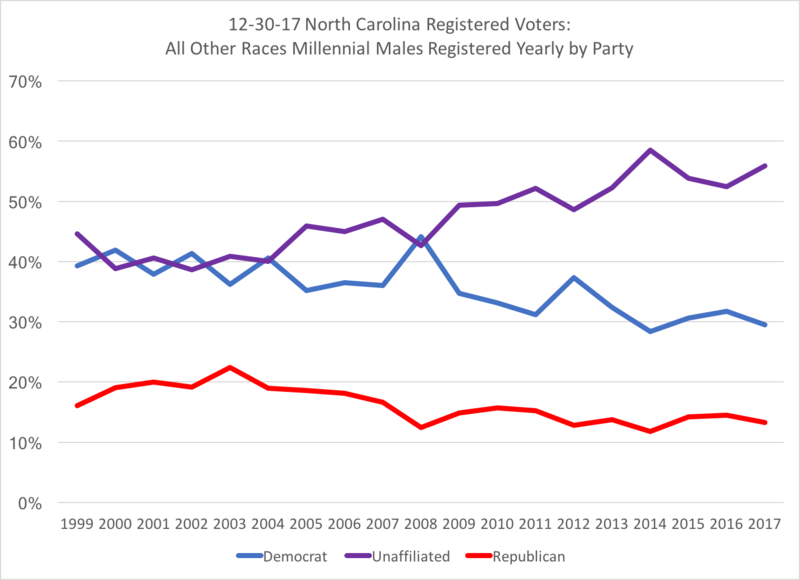 As a follow-up to the previous post, I thought about the division among race and gender when it comes to North Carolina's Millennial registered voters, and broke out the 2 million registered voters under the age of 35 as of the December 30, 2017 voter registration file, courtesy of the North Carolina Board of Elections. 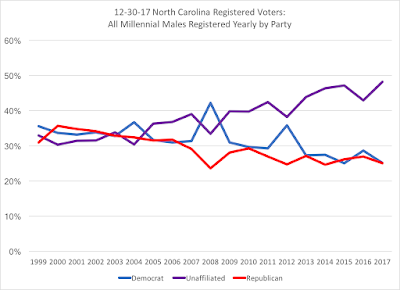 Even before Barack Obama's 2008 campaign focus on younger voters at the time, North Carolina Millennials were registering a plurality with the Democratic Party, while Republicans were battling with "unaffiliated" status for second place. 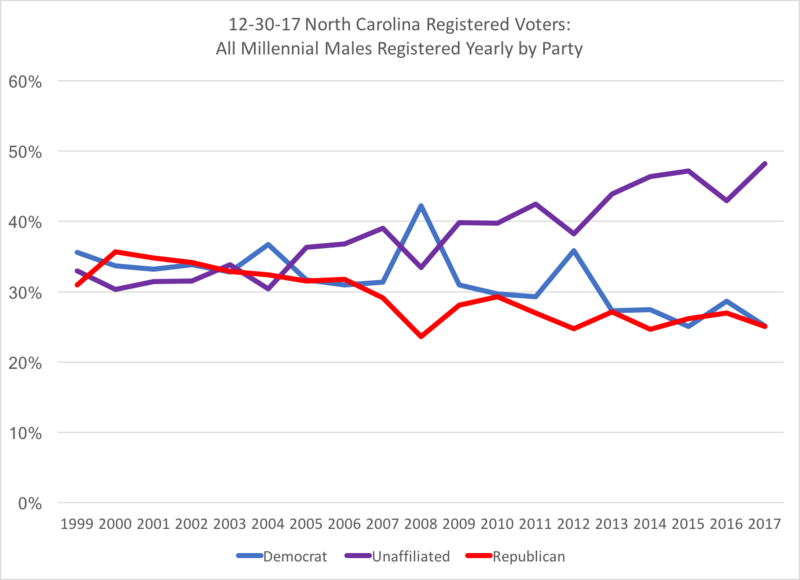 But after 2005, the growth in unaffiliated registrations began to compete with Democratic registration, leaving registered Republicans running below 30 percent. 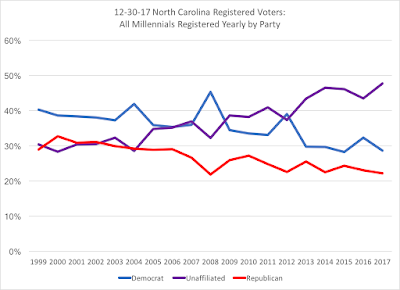 As is typical in presidential years, registration levels tend to spike in numbers, and Democrats see a healthy boast in their percentage registration in those years. 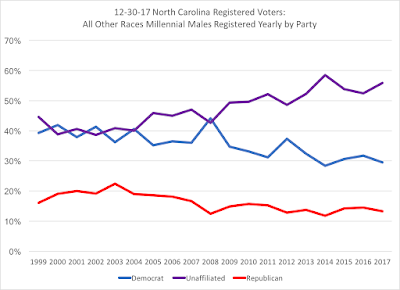 But in the intervening years between 2008 and 2012, unaffiliated voters became the plurality yearly group, and have continued after 2012's election to dominate, nearing nearly half of the registered Millennial voters in 2017. 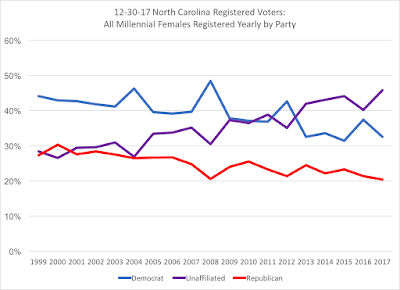 In breaking this registration cohort into gender, one can see distinct differences between female and male Millennials. 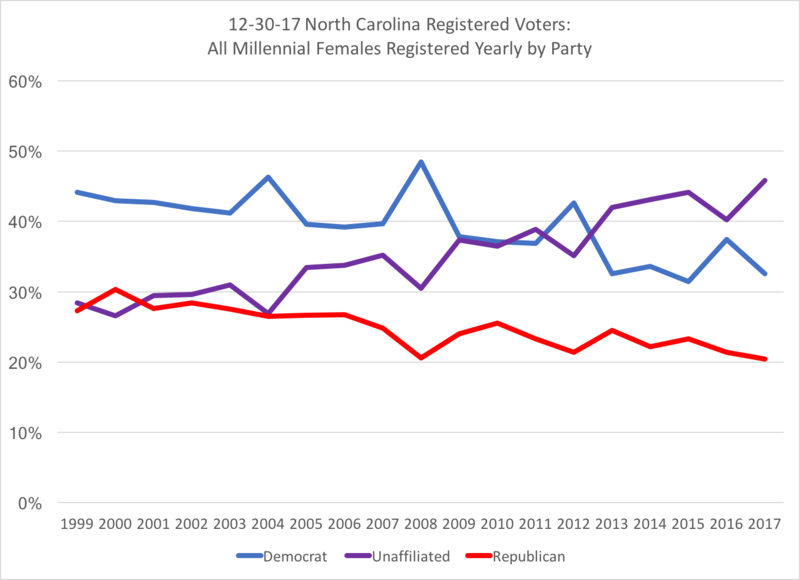 What is interesting in these two gender comparisons is that while Millennial female voters registered more Democratic up to 2008 (traditionally, women have been more Democratic in leaning and voting behavior), Millennial males were evenly divided among the party affiliation groups up to 2004's election, when unaffiliated status began to run ahead of partisan registrations, again with the exception of the presidential year "spikes" in Democratic registration, most likely driven by black/African-American males. 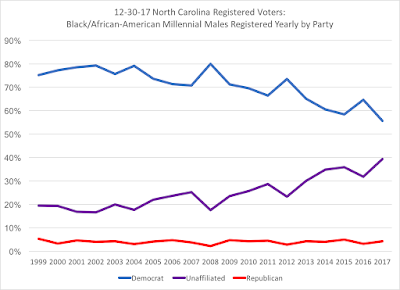 In most political science research on Southern US politics, male voters, especially white males, are the core base of the Republican Party, while black voters are the core of the Democratic Party. 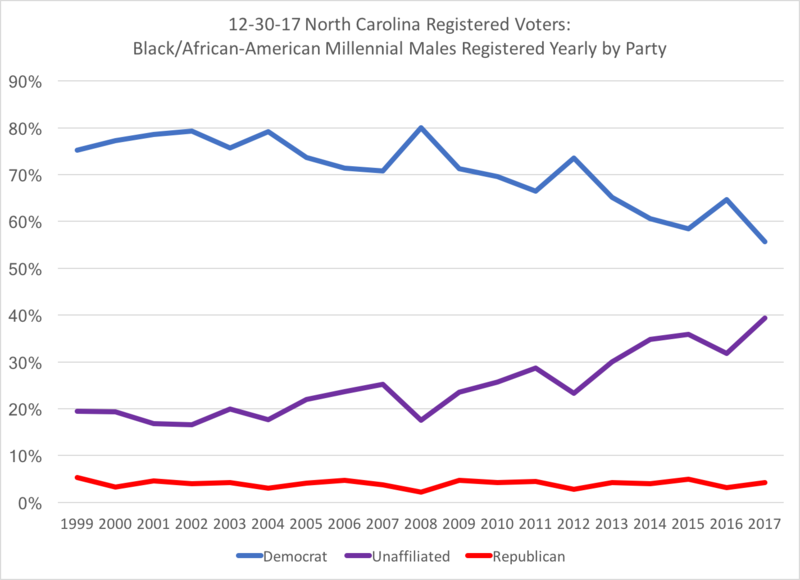 Among Millennial male voters registered as of December 30, 2017, 65 percent of them identify as white, 25 percent as black/African-American, and 11 percent as all other races. 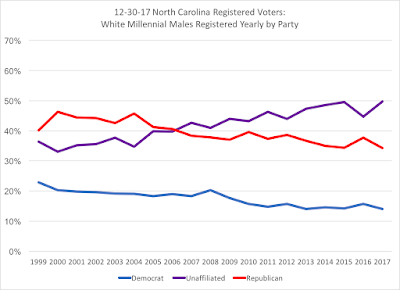 Democratic registration among white Millennial males has shrunk to the mid-teens, while registered unaffiliated status reached 50 percent in both 2015 and 2017. 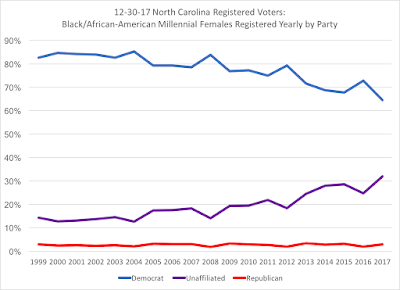 However, the recent decline in Democratic registration among black Millennial voters and the corresponding rise in unaffiliated status (with registered Republicans being flat-line over time) is noticeable to watch, particular in comparison to black/African-American females. 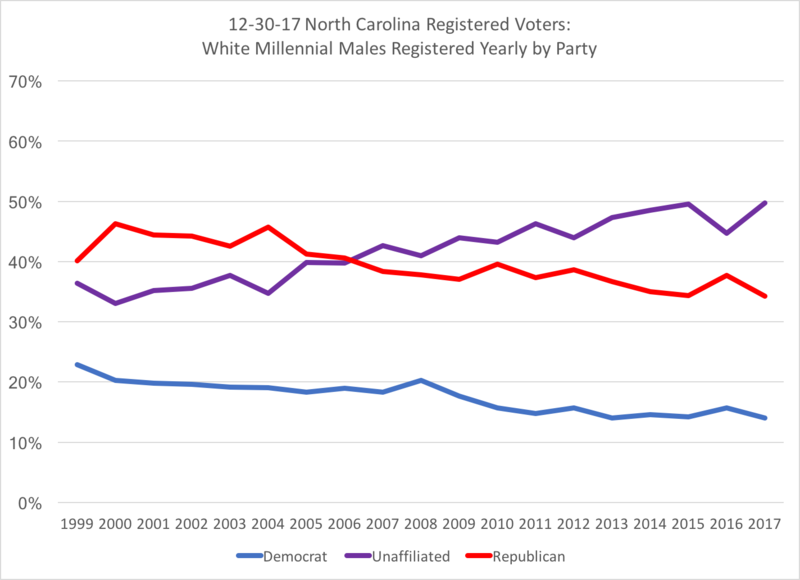 Among Millennials who are "other races" (Asian, native Indian, other race, multi-racial, or unknown), registered unaffiliated status was back and forth with registered Democratic status until 2004, when again the percentage of unaffiliated started to take off, reading nearly 60 percent of that group in 2014. 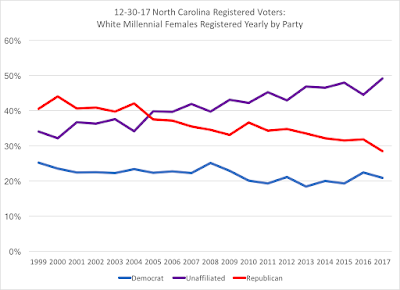 Now, in looking at the majority of Millennial voters (51 percent), the trends for different racial groups within female registered voters show a slightly more Democratic lean, but still with the rise of the unaffiliated voters. 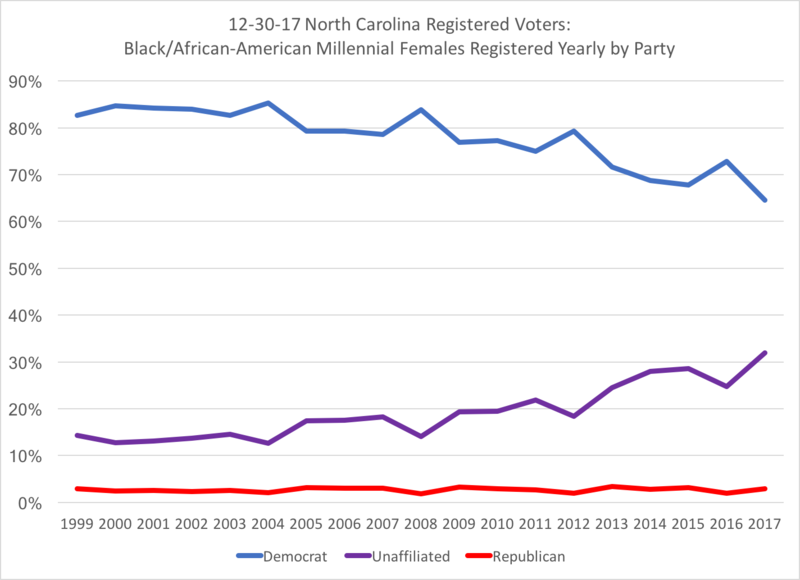 As a whole, female Millennial voters in North Carolina are more racial diverse than male Millennials, with 62 percent identifying as white, 27 percent black/African-American, and 11 percent all other races. 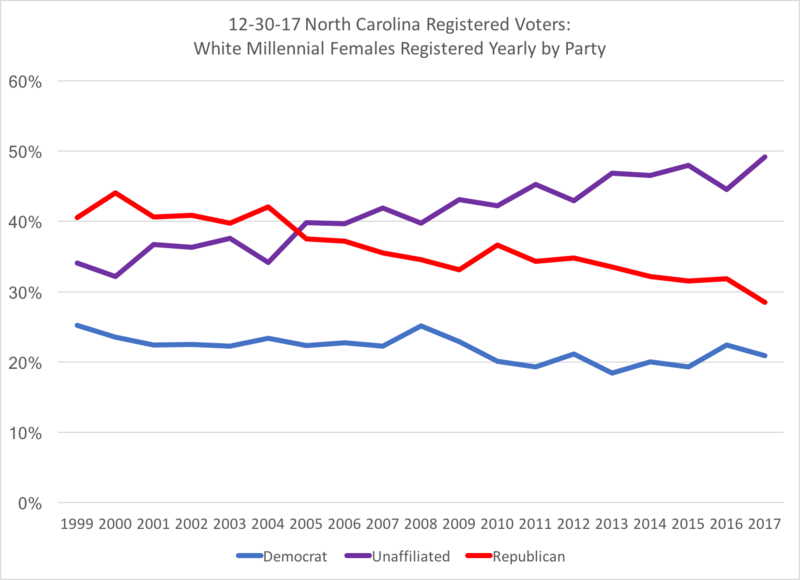 Democratic registration has held steady at 20 percent, a few percentage points higher than white Millennial males, but the unaffiliated registration status was at 49 percent in 2017 for white Millennial women. 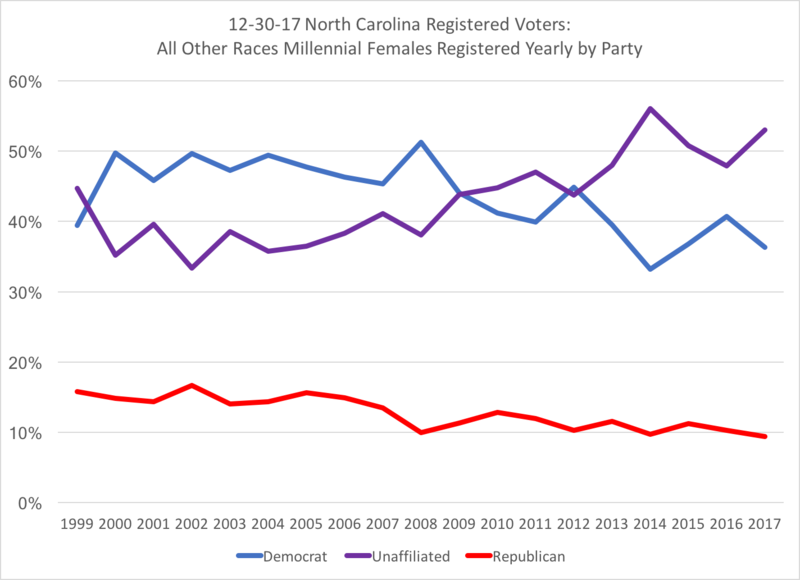 Among Millennial females of all other races, Democratic registration advantage held through the 2008 election, but again, unaffiliated status has taken over since 2012's election, with registered Republican affiliation dropping to around 10 percent for the past several years. 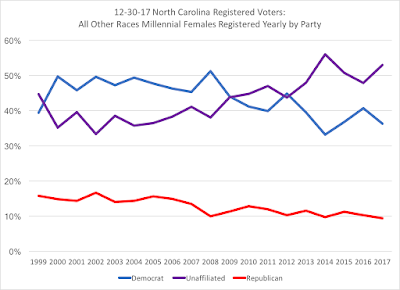 As we enter a mid-term election year with a "blue moon" election cycle in North Carolina (meaning, no gubernatorial nor U.S. Senate race state-wide, but some judicial state-wide races), the focus will be on the congressional and legislative districts. 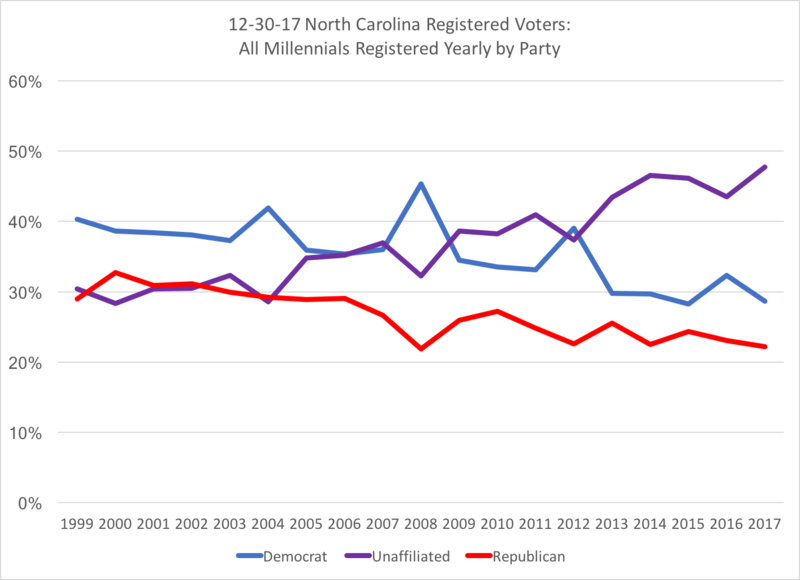 And while the voter registration numbers typically don't "spike" as greatly as in a presidential year, it will be notable to see if these trends continue for Millennial and Gen Z voters as these graphs present. Again, as noted in the previous post, registering "unaffiliated" does not mean that one is "purely" independent in voting behavior. If you have specific questions, please feel free to send me a tweet @bowtiepolitics and I'll get back to you.